There's something about dinosaurs that brings out the kind in many of us. Maybe it's because it's they're most fascinating to us when we're younger. Maybe it's because of animated features like The Land Before Time or popular movies like Jurassic Park. But whatever the reason, Dinosaur Island as a game seems to tap into this dinosaur magic whenever we present the game to friends for the first time. And that sort of reaction is rather fascinating given how often it happens. I never imagined that we would ever game a game that can best be described as "competitive Jurassic Park" but that's exactly what this game is. And the delight of this game keeps on giving once you get over the hump of explaining the game. Dinosaur Island dinosaur-centric worker placement game created by Jonathan Gilmour and Brian Lewis. 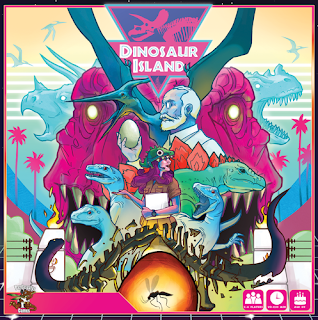 The game started as a Kickstarter project and now they have a new Kickstarter for their first expansion: Dinosaur Island: Back From Extinction. The game has 2-4 players playing as rival companies putting up their own dinosaur theme parks. The game is played across four phases with turn order determined by who has the least amount of victory points at the end of a round. Phase 1 is all about researching dinosaur recipes and collecting dinosaur DNA to be used in creating new dinosaurs. Phase 2 is when players purchase new attractions, lab upgrades or specialists to help with your operations. Phase 3 is when you go about taking actions on your individual player board to create dinosaurs, increase paddock size and increase security level among other actions. Then finally comes the ever fun Phase 4 when players draw visitors from the bag, hope they don't get hooligans who don't pay entrance and generally make trouble and hope that the dinosaurs don't escape. The game ends when all but one of the shared objective cards have been completed. What I Liked: This Deluxe Edition of Dinosaur Island is a total delight given the adorable dinosaur meeples, the crazy bonus pog tiles and of course the ridiculously heavy metal coins. A lot of love went into this edition and it just reflects how successful the Kickstarter for this game was at the time. Beyond the deluxe elements, the core components of the game involve a lot of intelligent humor given all the punny names for various attractions and even the suggested first player selection mechanic in the manual. But the game isn't all fluff - at the heart of things is a very smart game with a good amount of balance and a lot of ways to win. Do you want to focus on safer herbivores that don't risk the overall threat level or do you want to try raising bigger carnivores at the risk of escapes leading to dead patrons? Will you upgrade your lab to be more effcient or will you focus on additional amenities for your park in order to support more guests? There are a lot of options and each one can provide a new path for points. What Could Have Been Better: The deluxe edition gives a nice variety of different types of dinosaur figures but they have not systemic difference nor will you be able to always have a sufficient number of dinosaurs matching your recipes. It's a minor pain point but one that nags at you as you try to figure things out. And when you're playing the game in its Long Game mode, you will start running out of dinosaurs. The game was weird quirks that I'm sure are there for balance but don't feel satisfying all the time. Case in point, any patron watching a dinosaur in Phase 4 can earn you 1 victory point and this does not change regardless of dinosaur type. You'd think that having a bigger dinosaur might mean 2 points per patron, but this is not the case. And the price scale for attractions is pretty steep so it's hard to endeavor to work on this without investing a few rounds of play without really moving your victory points. TL;DR: Dinosaur Island is an amazing game and one that we have really come to love playing. The deluxe set has beautifully crafted components and offers a nice play experience for any dinosaur-lover. Thus the game gets a great 5 dinosaur escapes out of a possible 5.